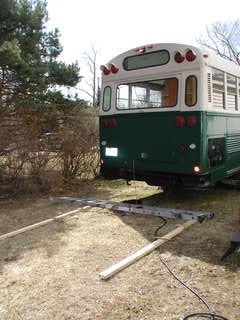 Last year when I had the bus inspected for it's Massachusetts sticker the guy said that I should have a set of wheel chocks on board any vehicle with air brakes. I have been carrying four nice big chunks of firewood for this task but I figured I'd make myself a set of wheel chock that had a little more professional look. These were built out of chunks of scrap pressure treated lumber from a deck project. They are held together with polyurethane construction adhesive and deck screws. 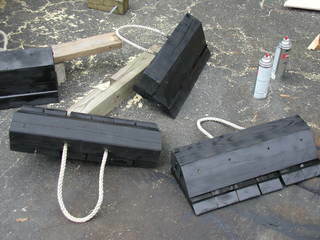 Holes were drilled and the rope handles installed before the chocks were assembled. The teleconferencing camera I was planning to use for a backup camera did not have a wide enough view angle so I bought this monochrome backup camera from Northern Tool. I bought this backup camera from Northern Tool. 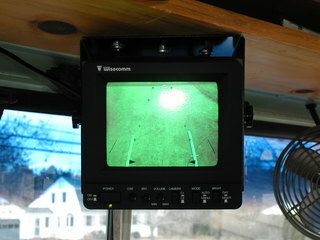 After I installed the camera I laid out a couple of 2x4s behind the bus so I could aim it correctly. Here's the view from the cockpit. Note the 2x4s and note that the ladder is not visible. There is a blind spot imediately behind the bumper about 2 feet deep. 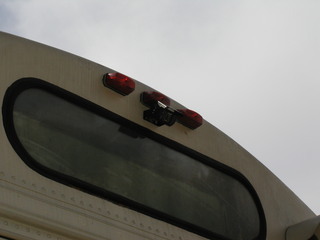 The camera bracket has holes to set the angle, it's not continuosly adjustable and if I eliminated the blind stop half of the monitor screen showed only the back of the bus. 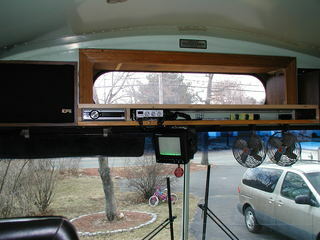 I mounted the monitor where the rear view mirror would be if the bus had one. I keep looking here when I'm driving the bus so I figured I'd take advantage of that engrained behavior rather then having to try and un-learn it. 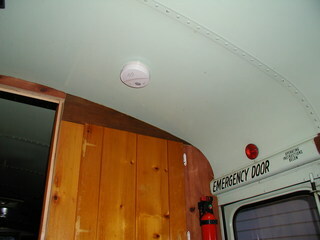 I also mounted the CB radio and connected it to the four ceiling speakers that came in the roof of the bus so I could use the PA feature to holler at the kids! 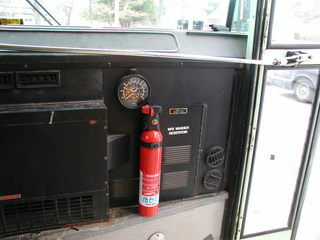 Fire extinguisher at the front of the bus. 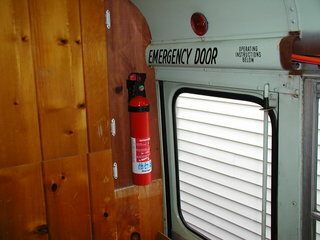 Fire extinguisher in the kids bunk room by the middle door. Massachusetts now requires these for all homes so when I ordered them for the house I got one for the bus too. This is an RV/Marine unit and was about twice the cost of the ones for the house.